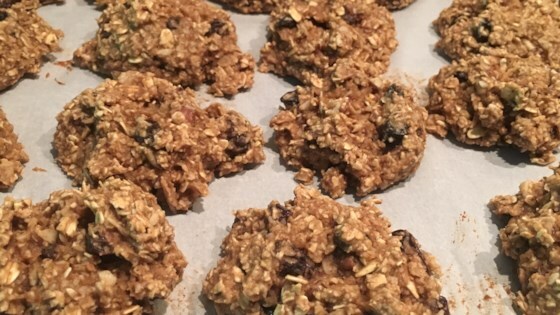 "These are high fiber, high protein, low in fat and absolutely delicious cookies that make a terrific snack. You won't believe how good they are! Any dried fruit or nuts are recommended as additions to this recipe." Preheat the oven to 325 degrees F (165 degrees C). Grease cookie sheets. Grind the oats in a blender until resembling coarse flour. In a medium bowl, mash beans to a smooth paste. Stir in the white sugar, brown sugar and vanilla until well blended. Combine the ground oats, baking powder, baking soda and cinnamon; blend into the bean mixture. Stir in the dates, coconut, raisins and walnuts. Drop dough by heaping spoonfuls onto the prepared cookie sheet. Bake for 10 to 15 minutes in the preheated oven, until golden. Cool on baking sheets for 5 minutes then remove to wire racks to cool completely. I added 1/2 cup of soy milk (as the recipe was a little too dry), and increased the dates to 1 cup. I got 22 cookies out of the recipe. My husband loved them!